Zampella: Titanfall "not gunning for Call of Duty"
Titanfall is one of the biggest releases on the gaming calendar for early next year, but it's not coming from an especially big developer. Speaking with GamesIndustry International at E3, Respawn co-founder Vince Zampella explained how the game's Microsoft exclusivity and multiplayer focus go hand-in-hand with the fledgling studio's structure. "For us, we're a small startup studio," Zampella said. "We're 60-some developers. So for us to be able to focus on one platform [helps]. For us it was really helpful to focus on the core game and what's fun. It's scoped more adequately to what we have the power to do as a start-up studio." Part of that scope means scrapping the single-player first-person shooter campaign template that Zampella helped define at Call of Duty developer Infinity Ward. "We make these single-player missions that take up all the focus of the studio, that take a huge team six months to make, and players run through it in 8 minutes," Zampella said. "And how many people finish the single-player game? It's a small percentage. It's like, everyone plays through the first level, but 5 percent of people finish the game. Really, you split the team. They're two different games. They're balanced differently, they're scoped differently. But people spend hundreds of hours in the multiplayer experience versus 'as little time as possible rushing to the end' [in single-player]. So why do all the resources go there? To us it made sense to put it here. Now everybody sees all those resources, and multiplayer is better. For us it made sense." Titanfall will be Respawn's debut release. Titanfall will still have some narrative, but it will be accessed from within the main multiplayer mode. Zampella was careful not to be outright disdainful of the single-player/multiplayer divide seen in other games, and said it could be done successfully if enough resources were devoted to the project. Assassin's Creed was one such franchise where he said the catch-all approach had clearly worked. As for how he feels working on a new entry in the first-person shooter category dominated by his old franchise, Call of Duty, Zampella downplayed the idea of the two games as direct competition. "Honestly, we're not shipping the same time as them," Zampella said. "We're going for something different. We're not gunning for Call of Duty. We're doing our thing. The important thing is to make sure what we're doing is fun. I'm OK with Call of Duty being big. I helped create it, so I'm proud to see it's something so big that it goes beyond me." 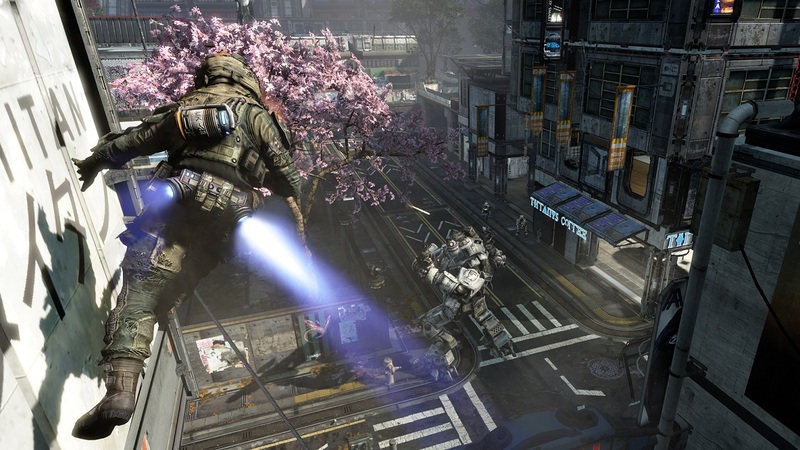 Titanfall is set for a spring 2014 release, while Call of Duty: Ghosts launches November 5. I understand their reasons for going multiplayer only and they are true (I hate the gaming community for that, few play the main portion of the game), but for me it means I'm gonna skip this title. The quotes about how the story is told sounds familiar in a very Enemy Territory: Quakewars sort of way. Personally I expected Titanfall to go more in the direction of Borderlands or Destiny. Focusing purely on the competitive side of multiplayer is a bit of a surprise.